The holiday season is a popular time for giving and receiving personalized gifts, from monogrammed mugs and engraved inkwells to embroidered bags and custom phone cases. These specialty items tend to require more lead time to produce than other gifts, so it's never too soon to configure and offer these products to your shoppers. You can add personalization options to a product that already exists in your store, or you can create an entirely new product. Some merchants may even choose to offer two versions of the same item in their store: one with customization options, and one without. If you haven't already created the customizable product, start by going to Inventory > Products in your Admin Area. Once you've created your product, you can start adding customization options for shoppers to choose from. 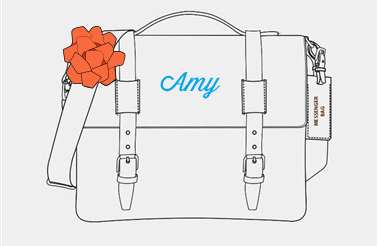 For the purposes of this article, we'll add customization options to an existing "messenger bag" product. Before you can add specific options, you'll need to create option categories for each product attribute that a shopper can modify (Color, Size, Style, etc.). Once the option categories exist, you'll be able to add specific options (red, blue, small, medium) to their respective option categories. Dropdown: The default display type. Options in this category display as a drop-down list. Checkbox: This display type should only be used if there is a single option. A warning message will be displayed on the product page if you assign more than one option belonging to a category with this display type. Radio: This display type shows a list of options, each prefixed with a radio button. Shoppers can only select one radio button option at a time. Textbox: If your product requires the shopper to supply custom text - an inscription for a bracelet, for example, or a slogan for a t-shirt, use this display type to provide a textbox. Our messenger bag comes in three different fabrics, with the option to add custom embroidery in one of three complimentary colors. In order to make these options available to shoppers, we'll create three option categories: Fabric Color (drop-down), Embroidery Color (drop-down), and Personalization Text (textbox). Go to Inventory > Options in the Admin Area. Select Option Categories from the Filter menu. Click Add at the top of the page. In the Option Description field, enter the option category title as you want it to appear on product pages (e.g. "Fabric Color" or "Embroidery Color"). In the Display Order field, enter a number to designate where this option category will appear in relation to other option categories. Enter "1" to make the current option category appear before all others, "2" to make it appear second in the list of option categories, "9999" to make it appear after all other option categories, and so on. Set the Display Type to Dropdown. In the Option Description field, enter the option category title as you want it to appear on product pages (e.g. "Personalization Text"). Set the Display Type to Textbox. Now that you've created option categories, you can add options to each one. Go to Inventory > Options. Select Options from the Filter menu. Click Add at the top of the page to create a new option. In the Price Diff field, add a monetary value if you want to charge more for a specific option. If you don't want to associate any additional costs with the option, enter "0". For example, you may want to charge an additional $5.00 for custom embroidery, but not for a different fabric color. In the Option Category drop-down, select the option category to which this option belongs. A product option can only be assigned to one category. In the Option Description field, add a short description of the option (e.g. a specific fabric color or item size). Click Advanced Info to enter a numeric value in the Display Order field. The lower the number, the higher the option will appear in a drop-down or radio button list (an option with a display order of "1" will display at the top of the list of options). If multiple options have the same value, they will be arranged alphabetically. Repeat the process for any additional options you'd like to include in a specific drop-down option category. If you're using a textbox option category (such as "Personalization Text"), you only need to create one option in order for the textbox to appear. Click Add to create a new option. In the Price Diff field, add a monetary value if you want to charge more for a specific option. If you don't want to associate any additional costs with the option, enter "0". In the Option Category drop-down, select the option category to which this option belongs (in this example, "Personalization Text"). If an option belongs to an option category set to display type Textbox, this field lets you specify the length of the text box. Note that this does not affect the maximum or minimum number of characters that can be entered (see below). If an option belongs to an option category set to display type Textbox, this field lets you specify the maximum number of characters that can be entered. Be sure to let shoppers know about any character limits by adding a note to the About Option Category field within the textbox option category. Similar to the TextBox_Size field, this field can be used to set the vertical height (number of rows) of a text box. The default value is 1. See our article on Product Options for more details about options and option categories. Go to Inventory > Products and click on your customizable product to edit it. Locate the Options field and click Select Options to display the option selector window. Click on each applicable option category and check off the available options for this product, including the single option for Personalization Text. To preview how your options will appear on the storefront, click View Live at the top of the product editing page. If you're not satisfied with the order or display type for any of your option categories, you can return to Inventory > Options to edit them. Some stores use swatch images to give shoppers a more realistic idea of what a specific product option will look like. Swatch images aren't practical for all products and configurations, but they work well for items that have different color variations. For example, a merchant who sells the messenger bag from our example might want to show small swatch thumbnails of the different fabric and embroidery colors, as well as an example of the embroidery font. To learn more about configuring swatch images, see Color Swatch Options. Some products may require more time and resources to produce if a shopper adds customization. You can pass this cost on to your shoppers by adding a Price Diff to a specific option, or by adding a setup cost to the product itself. Go to Inventory > Products and click on a specific product to edit it. Expand the Advanced Info section, then click the Pricing tab on the left. In the Setup Cost field, enter an additional fee associated with this product. You can indicate the reason for this setup cost by entering text in the Setup Cost Title field. If you include a setup cost for customizable products, be sure to indicate whether or not it's refundable in your Return Policy. Having a good return policy can boost customer trust and help you to drive more sales. It's important that your Return Policy can be found easily on your website, and that it includes a section pertaining to custom/personalized products. Be sure to link to it from your company's Terms and Conditions page, and consider including a Return Policy link in your OrderHasShipped.asp email to your customers. While viewing your storefront as a logged-in administrator, go to www.yourvolusionstore.com/returns.asp (making sure to replace "www.yourvolusionstore.com" with your store's web address). Use the Content Builder to generate content for formatted text and images. If you're not sure what to include, check out our Ecommerce Insights blog post on How to Write a Killer Ecommerce Return Policy. Most Volusion themes include footer links to your store's Return Policy and Terms & Conditions. If your theme doesn't contain those links already, see How to Add, Edit, or Remove Footer Links for instructions on adding them. During the holiday season, many of your shoppers may be shipping personalized gifts directly to the recipient. Consider enabling Gift Options at checkout so that your shoppers can select gift wrapping or include a gift note. When you receive an order that contains gift notes, you'll be able to view them by clicking Gift Notes in the Notes section of the Order Details page. Gift notes will also appear on the printed order invoice. For more information, see our article on gift wrapping and gift notes.